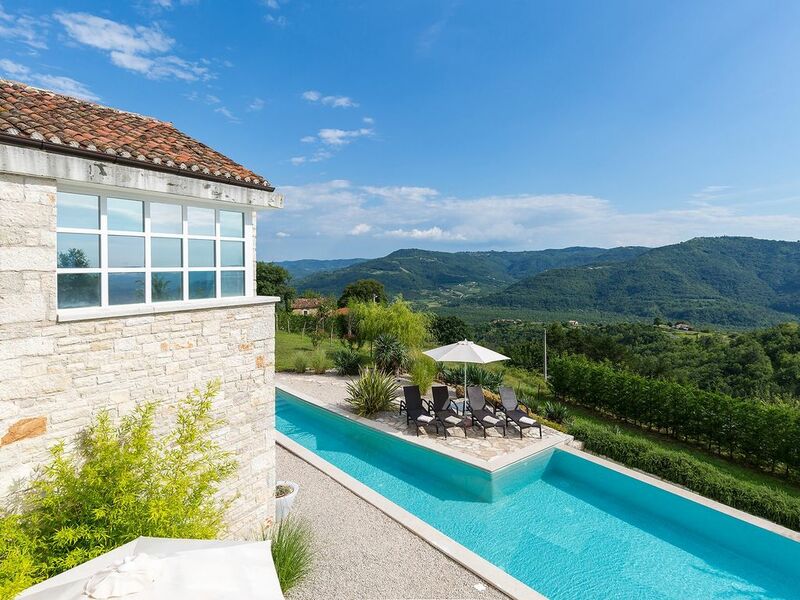 Casa Roma is a traditional Istrian stone villa, located in a small hamlet of Sv. Kirin. The villa is located in a quiet place on the top of the hill, giving you a view of the beautiful nature and Lake Butoniga. This beautiful villa, whose exterior and interior exudes charm and personality, is fully air-conditioned and offers accommodation for a total of 10 people in 5 double rooms, 4 have their own bathrooms, and one has a Toilet nearby. The main bedroom has the largest bathroom.The gorgeous kitchen is fully equipped and continues to a comfortable living room equipped with SAT TV, DVD, CD and iPod connection with speakers spread throughout the villa. A special feature of the villa is the roof terrace with a beautiful view of nature and its private overflow pool (25 m2). Casa Roma is the perfect choice for families with children who can have enjoy a game of table tennis or spend their time on the playground in the fresh air. Nature lovers can explore the area free of charge by using the bikes at their disposal. On request we can arrange a private chef service, catering, cleaning and maintenance service as well as relaxing massages at the pool.